Skiing in Kyrgyzstan was a step up from not skiing at all, Sulu Tyr near Bishkek was a good place to learn, a baptism of feathers, although I probably didn’t think so at the time. It wasn’t easy the first few times, as it wouldn’t be for a beginner, but the challenge factor there was avoiding rocks. It’s not the longest or steepest of slopes, and although I have fond memories of it I’d probably see it as a step backwards to ski there now. Why? 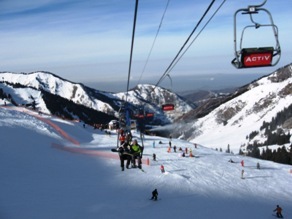 Well just outside Almaty is the real deal, Chimbulak, still not the most challenging of ski resorts all told but as, at the time of writing, I still class as a beginner, by far adequate and refreshingly in possession of three ski lifts from the foot of the hill which cut queuing time almost to zero. 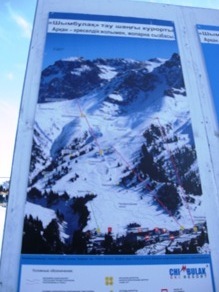 There are also two higher level ski lifts with no queues at all the highest of which takes you almost over the end of the summit. Just up from it is a 4,000 plus metre peak which obviously isn’t a constituent part of the skiing but worth a ride up the freezing cold rickety single chair final lift just to see. Slightly more responsibility on the part of the resort owners and I wouldn’t have got to the top. I think they are right, people need to look after themselves for the most part, but what I’m getting at really is, this morning, with the skills I have, I was not good enough to tackle slopes as challenging as those. The top down to about three quarters height is like a steep incline of dozens of randomly parked Volkswagens, the snow is about three feet deep and any disrespect, it takes you. At this stage I was skiing like a mountain goat, not in fact a positive metaphor in that mountain goats can’t ski, but even allowing for this, if you watch them closely they don’t seem as sure footed as they really are. 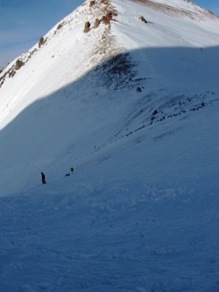 My skiing was like this, I made it down to the station with both legs still working, but the shifting round on my skis and hopping from snowy hillock to snowy crevice made me look decidedly feeble. My friend said I should keep my knees together. I wanted to remark that I spend my whole life doing so and that chance to let my hair down once in a while is inevitably going to be taken. But then it’s not literally true, relevant, and the metaphor would have been wasted on a non-native speaker, excellent though his English may be. Chimbulak is located in the upper part of the Medeu Valley in the Zaiilisky Alatau mountain range, at the elevation of 2200 meters above sea level, although the highest point is at 3200 metres. 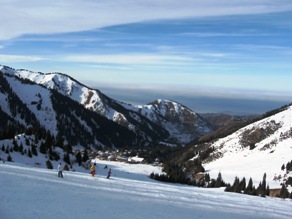 The resort area is about 25 km south of Almaty city by the Medeo road. It is popular for its mild climate, large quantity of sunny days and great amount of snow through the winter (from November till May). 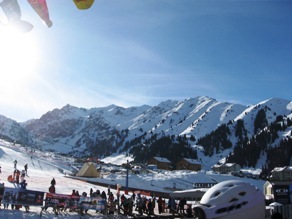 Kazakhstan will host the Asian Winter Games in 2011 so the resort is being upgraded. It’s not quite the Alps, but to be honest it’s a pretty good place which seems to be well looked after. There are hotels nearby and houses for rent at I believe $500 a night. I suppose there might be cheaper ones but they won’t be a lot less. I’m not sure I’d recommend it for a long skiing holiday because there isn’t enough variety. 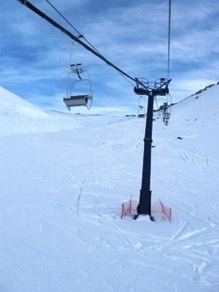 The ski lifts are good, I’m not so comfortable with heights but it beats walking up. Pity about the prices, but it shouldn’t be too surprising. It’s a once or twice a month thing, I’m not a church mouse but can’t afford to ski every week, unless I buy some skis, possible if I can get second hand ones. I’ll look into it. Stealing is not on my agenda but I did remark to myself how nonchalantly people leave skiing equipment lying round unattended. I know there is the argument that skiers are well-off therefore not driven by the unending need to feed families etc, but a degree of suspicion perhaps? Didn’t seem to have. I find skiing fun, perhaps a little strength work on my quads will make it more enjoyable, and of course more practice will help. 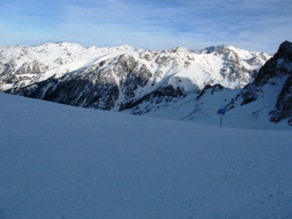 I try to go far too fast for my experience level, which by now is probably a total of 8 days skiing. By and large the speed is OK if on packed snow, but I came off a few times on thick snow. Oh, and then I lost my bottle. I started too well, and somehow permitted myself to believe I could shift like Franz Klammer (showing my age with that simile) and started trying to. Then I came off a few times, the first of which saw me slide on my back about 50 metres 49 of which accepting my leg was about to break in three places. The blessing of being able to get back up was duly received and taken as a hint that I should be more careful. From there, the self-doubt set in and I subsequently fell over a lot more. I finshed with the up-beat opinion that it would normally take some doing for a self-taught beginner to ski like that and so managed to get back to our transport without falling in the car park. Unlike Bishkek, there are more than snow covered mountains, and after 5 hours sliding down frozen water I really really needed a place to warm up. One of my fingers was toying with the idea of accepting the frostbite which had made it an offer. It was very painful, but it was about time I had some fun, and all in all this was the best fun I’ve had in a long time. 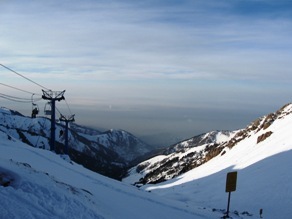 And, unlike the airborne goo obscuring the otherwise paradise city of Almaty here, fresh air! Bliss!